Thanks to its size and geologic features, Texas contains diverse landscapes that closely resemble both the south and southwest of the United States. Though most people associate Texas with tracts of barren land, deserts cover only about 10 percent of the state, with most of its big population centers located in areas once covered by prairies, grasslands, and forests. As you travel from one end of Texas to the other, observe the changing terrain that ranges from coastal piney woods and swamps in the east to the mountains of the west, with rolling plains and rugged hills in the center. 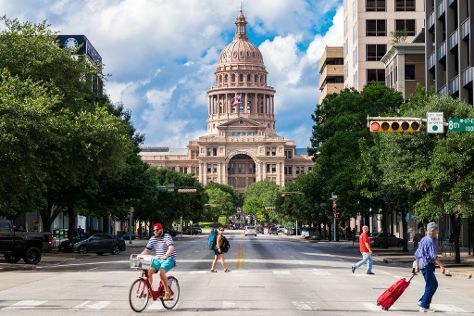 For a bit of urban sightseeing visit some of the state's large cities such as Houston, Dallas, or Austin, or immerse yourself in the nation's history by adding famous attractions like The Alamo to your itinerary. Take plenty of time to mingle with the locals, famous for their hospitality, generosity, and fiercely independent spirit. Texas is in United States. Our United States road trip tool allows you to schedule your trip to Texas, learn about its attractions, and find out about where else to go during your holiday.